Don't forgot the twofer tooltip as the cherry on top: "I literally could care less". Nice summary of Chapter 6 of Rules and Representations, (Chomsky 1978). A similar situation applies to the common question "Do you mind if I …?" Yes — by strict rules denies permission but in reality is not taken to mean this in popular speech. So in fact this usage seems to be largely rhetorical in the mind of the asker, with permission seeming all but impossible to deny. I first heard "I could care less" in the army in the 50s, and wondered at it. Later when it became general I decided it had spread from the army. The Ngram viewer does show it as originating from the 50s (at least in books). But army origin – who knows. Healthy people deny permission by saying things like "Better not," "I'd prefer you didn't," "That doesn't sound like a good idea," etc., etc. The linguistically prurient, on the other hand, have a difficult time getting over the words to the ideas, and thus wind up saying things like, "Well, yes, actually, I DO mind," etc. 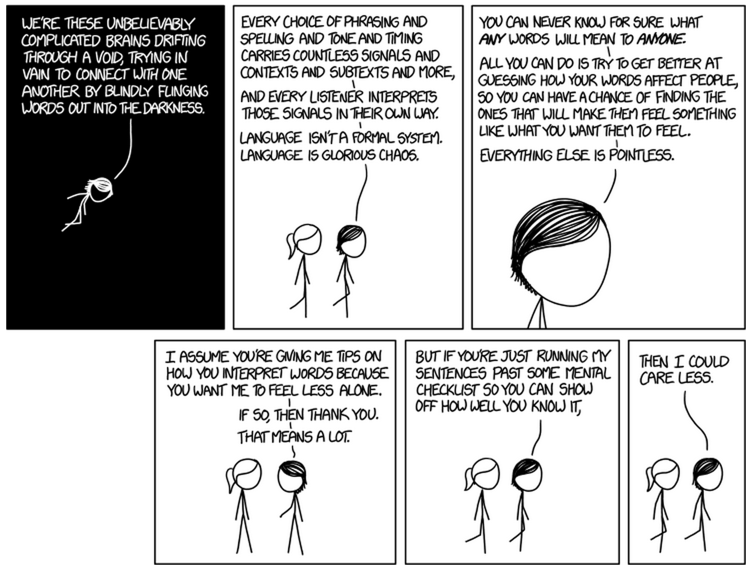 Hence this XKCD. In the vein of ambiguous phrases. If today is Monday, does "Next Tuesday" occur tomorrow or 8 days from now? Conversely, if it is Wednesday, does Last Tuesday refer to Yesterday or 8 days ago? Something to chew on. I used to have a circumstance, but I can't remember what is now where Next Week and This Week were the same week. 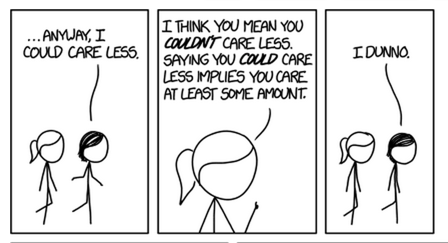 A classics teacher at my school England set "I couldn't care less" as an expression to translate into Latin. If I recall (over 50 years later), he was looking for "Non potui minus curare." Of course, in those days there was no "I could care less." Of course there are various ways to evade the trap and deny permission, but it seems to me people who ask for permission this way are presuming permission has already been given. @Bruce, JS: If I am not in a good mood or don't like somebody making a request like that, and I want to deny permission, I sometimes say, "Yes, I do mind." There is turn of phrase from England not current in the US :"this Monday week", meaning "one week after the following Monday"
Perfectly current in West Virginia at least, though it mystified my contemporaries at Indiana U. It's perfectly current in West Virginia at least, though it flummoxed my contemporaries at Indiana U. Sorry for the duplication; I encountered some glitch. Other Brits may disagree, but I would say simply "Monday week" rather than "This Monday week". I don't think I've ever encountered the latter version. @Ken Miner: I haven't seen any evidence that the Army was responsible for the early spread of "could care less." The earliest example I've found is from a 1955 Washington Post column by sportswriter Shirley Povich ("Casey Stengel could care less about the Dodgers' reputation for beating southpaws"). FWIW, Povich served as a war correspondent during WWII. The last time I went to France (to be precise it was the Languedoc, and until a few years ago you could hear occitan spoken by the elders) a young was telling someone not to worry -that would be ne t´inquiète pas- and he said instead "t´inquiète" , accompanied by a denying gesture with his head. I'm more concerned that faceless-black-haired character (with whom we are meant to agree rather than with faceless-blondie) thinks language is best understood as a tool to 'make (others) feel what you want them to feel'. @Levantine: Other Brits may disagree, but I would say simply "Monday week" rather than "This Monday week". I don't think I've ever encountered the latter version. As a British-American (but just British for the first 50+ years), I very much agree: I'd say "Monday week", not "This Monday week". It unambiguously means "not the very next Monday, but the one a week later". I agree with Roger C and Mark S: the UK expression is "Monday week", and not "this Monday week". The expression is conspicuously absent in Scotland, and indeed is something of a Shibboleth: if you say "Monday week" up here, you must come from south of the border. Scottish is "a week on Monday". @Mark S: "Of course, in those days there was no "I could care less."" There's a problem with the dates on those quotations, which are taken from Google Books, and appear to have been mislabeled (the publication date given is that of the first volume of the series, not the volume where the quotation appears). For example, the second quote (supposedly from 1947) appears to be by Congressman Fred Schwengel, who was in office between 1955 and 1973 (with one interruption).